If you’re looking for natural sore throat remedies to help your little one feel more comfortable when sickness strikes, we’ve got 9 helpful ideas to help the whole family feel better sooner. These natural solutions have been a huge help to me over the years as I’ve dealt with various throat inflictions both myself and with my daughter, and while I’m all for using home remedies wherever possible, please remember to use your judgement. Always check with your doctor first, and never ignore symptoms that require medical attention. Most sore throats occur as the result of a virus, such as the common cold, and will clear up within a few days without medical treatment, but bacterial infections like strep throat require antibiotic treatment, so it’s always a good idea to check with your child’s doctor to rule out an infection or other medical condition that requires medical intervention before pursuing sore throat remedies for kids. Regardless of the reason behind your child’s sore throat – and the treatment dictated by her doctor – one thing remains certain: you want to find a way to offer your little one quick and effective relief. There is nothing worse than watching our children suffer when they are feeling under the weather, and when it hurts to talk and swallow, moms want sore throat remedies for kids that work FAST. Lucky for you, we’ve got 10 ideas that are not only effective, but that won’t cause your child to run screaming in the opposite direction. I’m serious! These sore throat remedies for kids actually taste good (with the exception of the salt water gargle, LOL), and have the added benefit of keeping sick children hydrated. Gargle with salt water. When it comes to sore throat remedies for kids (and adults), this is my first line of defense as I’ve always found it to be effective in reducing swelling and discomfort while also loosening mucus. I add about ½ a teaspoon of salt to a cup of warm water, mix thoroughly, and gargle 3-5 times per day until the sore throat is gone. If your kids find the salt mixture to be too unpleasant, you can always add a bit of honey to sweeten it, but make sure they spit it out after gargling!!! Honey. Honey offers quick and tasty sore throat relief for kids. Mix a tablespoon into a mug of warm water and sip slowly, or lick it straight off the spoon for instant relief. Just remember to avoid giving honey to kids under the age of 12 months due to the risk of botulism. Warm Jell-O mixture. When I asked my mom friends for their best sore throat remedies for kids, quite a few of them swore up and down that warm Jell-O mixture was the way to go. I have no idea why it works, but it’s a delicious option for kids, and it’s super simple to make. Prepare the mixture according to the directions on the box, but rather than putting it into the fridge to chill, allow it to cool slightly before drinking. Chamomile tea. Known for its anti-inflammatory and antioxidant properties, chamomile tea can help boost the immune system and fight off throat viruses and infections in older kids and adults, and it has the added benefit of keeping your little one hydrated. I always add a little honey for taste and additional soothing relief. Popsicles. Popsicles help keep uncomfortable kids hydrated while simultaneously numbing their mouths and throats so they can tolerate food. Warm water with lemon. Lemons contain antioxidants, and their acidic nature also helps reduce inflammation while simultaneously making it more difficult for viruses and bacteria to grow. Squeeze half a lemon into a mug of warm water, add a little honey for taste, and let your little one sip throughout the day. Cinnamon. Cinnamon is one of my favorite spices, and its antibacterial properties make it the perfect sore throat relief for kids. Add a little to your child’s tea or lemon water for taste, and use it to sweeten easy-to-eat foods like cooked apples to help tempt her appetite. Chicken noodle soup. While it’s not 100% clear why chicken noodle soup helps to reduce the duration of illnesses and makes us feel better sooner, encouraging your child to drink chicken noodle soup when she’s feeling unwell can help keep her mucous membranes moist and ward off irritation in her throat while also keeping her hydrated and eating. It’s a win-win! Essential oils. Essential oils have been used therapeutically for thousands of years to ward off illnesses, improve immunity, promote proper digestion, and alleviate pain, and a post about sore throat remedies for kids wouldn’t be complete without a list of essential oils to consider. The calming effects of lavender oil combined with its ability to soothe pain and improve respiratory issues makes this the oil of choice for many parents. Eucalyptus oil is another favorite as its anti-inflammatory properties can help reduce inflammation in the throat while also helping to alleviate congestion. Tea tree oil is another option to consider due to its anti-viral, anti-bacterial, and anti-inflammatory properties. Whichever oil(s) you choose to use, remember to use a carrier oil such as coconut oil or grape seed oil before applying to the skin, and to never allow your child to ingest essential oils. For more about essential oil use, read THIS POST. Marshmallows. Yup, you read that right. The last of my sore throat remedies for kids is to eat marshmallows. I prefer to refrigerate them first so they are cool and calming, but you can eat them straight out of the bag once you’ve paid for them at the grocery store. LOL! The gelatin helps coat your throat to soothe inflammation, and it’s definitely among the most delicious sore throat relief for kids! Since bacteria can gather on the bristles of a toothbrush, make sure to throw an infected person’s toothbrush away after a sore throat dissipates to avoid re-infection. And if a doctor ends up prescribing antibiotics to treat a bacterial infection, change toothbrushes halfway through the course of medication and once again when the full round of antibiotics has been completed. When Do We Need to Visit the Doctor for a Sore Throat? While most sore throats are the result of viruses like the common cold, do not cause severe pain, and often resolve on their own within a few days, it’s important to exercise caution. A kids sore throat that is severe, accompanied by a fever of 101F or higher, and doesn’t improve within 24 hours or so needs to be evaluated by a doctor. You should also seek medical attention if your little one is struggling to sleep and/or develops a rash. All of these are symptoms of strep throat (see below), which can lead to other health concerns if not treated properly. Remember that strep throat can be contagious for up to 3 weeks if left untreated, and can also lead to rheumatic fever, scarlet fever, kidney disease, and blood infections, so if you suspect you or your child has strep throat, be sure to make an appointment with your doctor for a throat culture. I hope this collection of sore throat remedies for kids helps provide your little one relief when she needs it most. Always consult with a doctor to confirm the reason for a sore throat, especially if fever, severe pain, difficulty sleeping, and/or a rash are present, and don’t ignore symptoms that worsen over time. 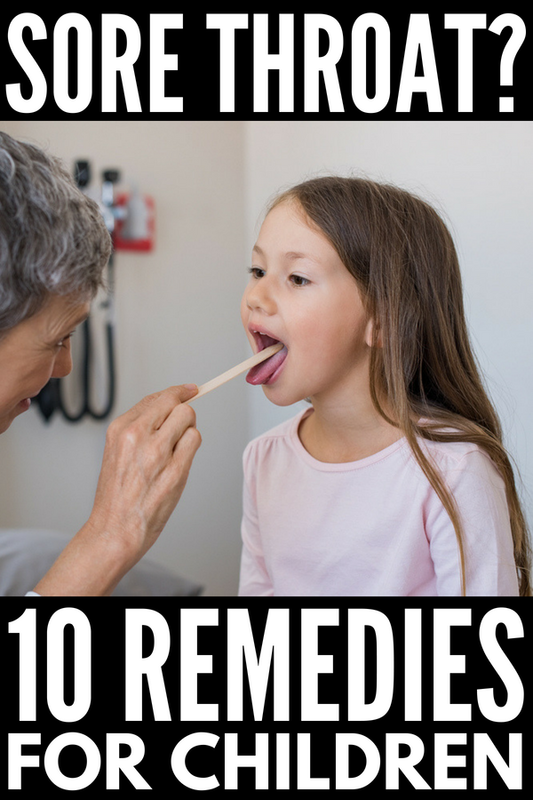 If you found this collection of sore throat remedies for kids helpful, please share this post on Pinterest!